Service 44 Bus from Ushaw Moor heading into Durham City | Flickr – Photo Sharing! This Bristol LS5G with an ECW B45F body was in service with United Automobile Services Limited. Service 44 from Ushaw Moor is heading into Durham City via Neville’s Cross and just leaving the (old) A1 at this point. via 20-01-62 United SHN748 Durham | Flickr – Photo Sharing!. Memories of Ushaw Moor: Roy Lambeth Nov 30th 2003. Having failed my 11+ exam, in September 1959 I went to Whinney Hill Secondary Modern School (i was living in Musgrave Gardens in Gilesgate, Durham). Some of the more senior boys tried to make us feel welcome by fiding out our interests and introducing us to senior with similar interests. Being a trainspotter I was introduced to the late Stephen Dent who lived at 22 Whitehouse Lane in Ushaw Moor (he was related to the Tallentyre Dent family – the bakers shop at the cross roads). His Father worked as a clerk with British Railways in Newcastle. One saturday I was invited to go with him to meet some of his railway friends. I went from Durham to Ushaw Moor by bus (United No.44), found Whitehouse Lane and headed up the back street as instructed. Since very few gates had numbers on them I soon lost count so I asked directions from an elderly lady, but before I got my information I was ushered into her kitchen and fed homemade cakes with a cup of tea. 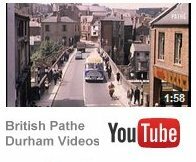 Being from a housing estate in Durham, this surprised me but I was to find out that it was typical of mining communities. Then I learned why I was in the back street. She told me that the front door was only used for “Hatches,Matches & Dispatches” but the back door was ALWAYS open.